Good Friday round our parts means seafood. And as like other years we usually have a pretty big crowd so a whole baked fish is a good way we’ve found to feed lots of people. 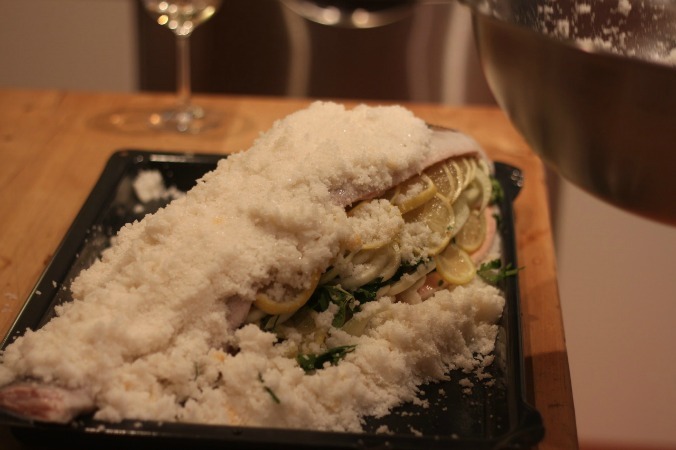 A few years back I watched while my brother in law whipped up a Salmon en croute for us all and this year seeing as he was around again I watched him while he whipped up something seen earlier in the week on Jamie’s show: a whole baked salmon in salt. Mum grabbed an ocean trout instead of a salmon at the fish markets but it did just the same trick. This fish was dead set DELICIOUS. Sure, a few steps with all the sides that go with it, but worth it for the tastiest, moistest, delicious tasting fish I think I have ever had come out of my kitchen. 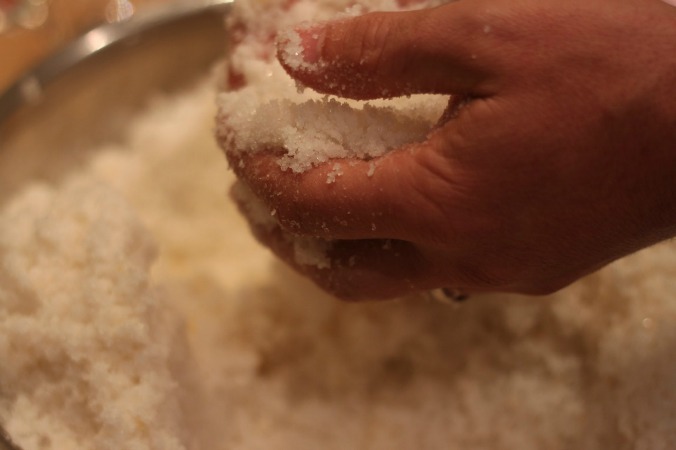 Not to mention the fun and theatre that comes with baking things in a salt crust. 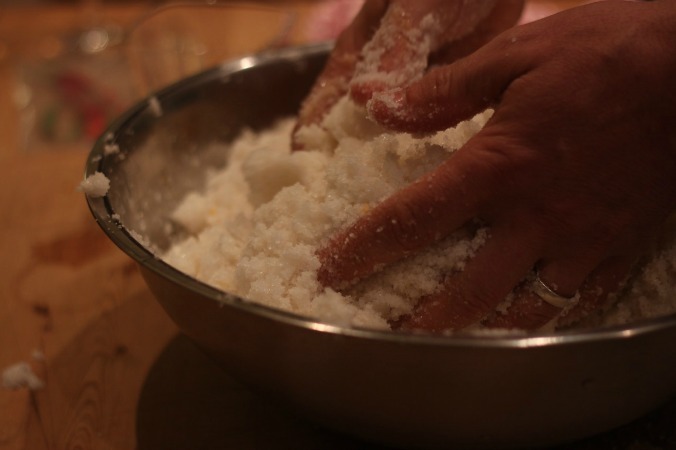 The original recipe can be found on Jamie Oliver’s website here. We started with the sides while we were sipping Prosecco and having a good old chat about all the problems of the world. First up was the basil mayo. 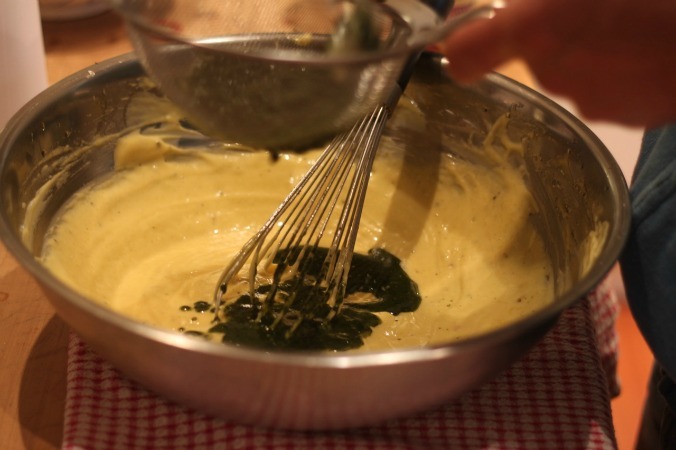 A simple home made mayo with some crushed basil leaves that leave almost a basil oil behind that is whipped through. 1. Take a bunch of basil and whack it into your mortar & pestle. give it a good bash with a lug of olive oil until you have a fine paste. 2. 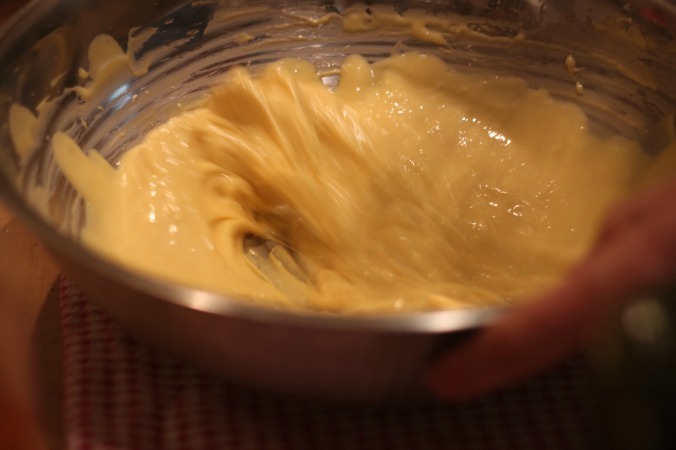 Place the egg yolk and mustard into a bowl, then gradually add the extra virgin olive oil, whisking as you go until silky smooth. 3. 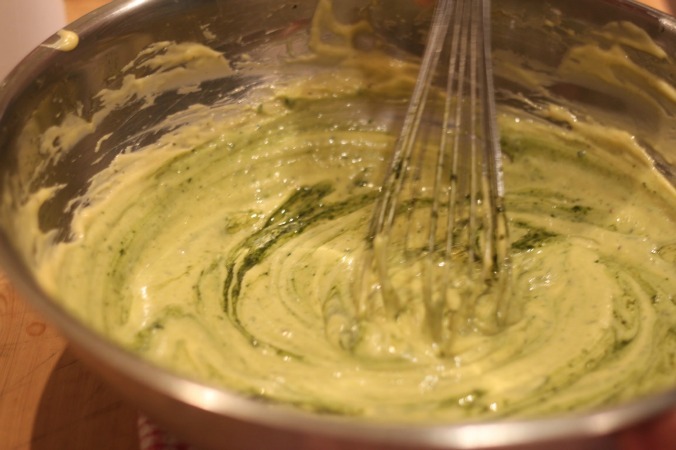 Take the basil paste and place it through a sieve into the mayo pushing the oil liquid through and leaving the basil leaves behind. 4. To make the salsa, finely chop the chilli and mint leaves, then place into a bowl with 1½ tablespoons of extra virgin olive oil and 1 teaspoon of vinegar. Season to taste with salt and pepper, then set aside. 5. Now onto the stuffing of the fish: Wash the salmon well both inside and out, then pat dry with kitchen paper (leaving the scales on helps to keep in the moisture as it cooks). Finely slice 1 lemon and the fennel into rounds and stuff into the salmon cavity with the parsley, marjoram and chives. Shove as much stuff as you can into the fish, even when you think you can’t add any more in, you can! 6. 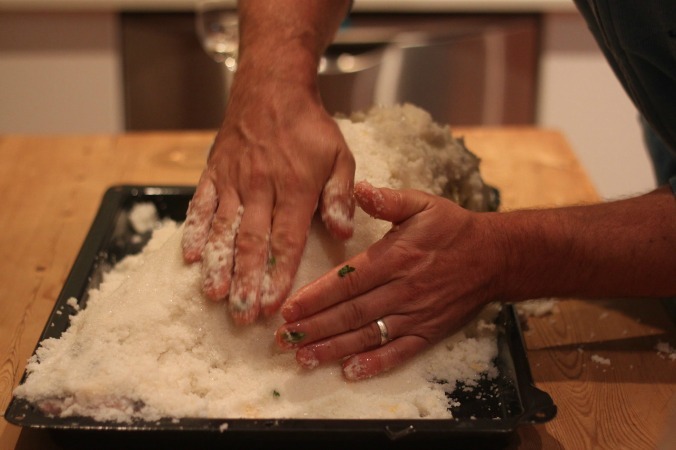 Now for the salt crust: We didn’t have the right salt for this…instead of rock salt we had normal salt, but it worked all the same. 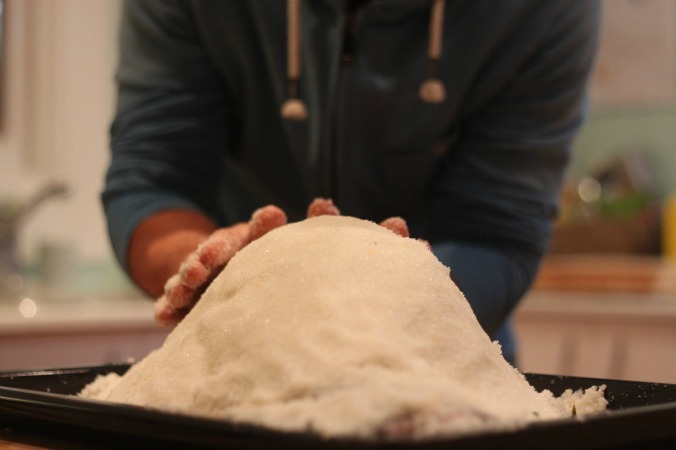 Combine the rock salt, eggs and 250ml of water in a large bowl, then evenly spread one-third of the salt over a large baking tray (roughly 35cm x 45cm), making a slight hollow in the middle to hold the salmon snugly. 7. 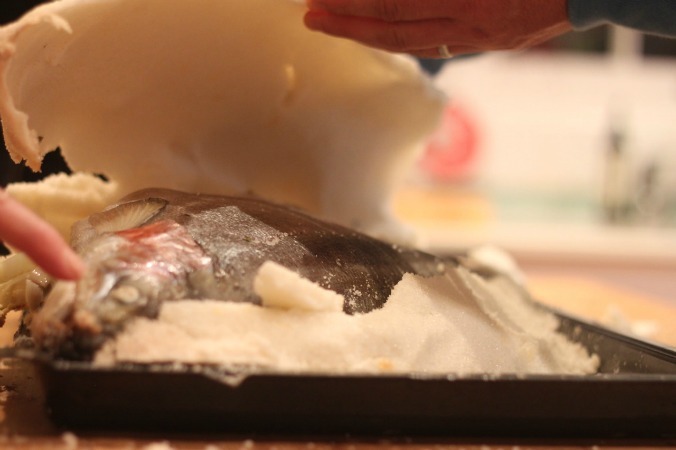 Lay the salmon diagonally into the tray, then spoon over the remaining salt mixture, heaping it around and onto the salmon so that it’s evenly covered – you should have a layer of salt, roughly 2cm thick, all over the salmon. 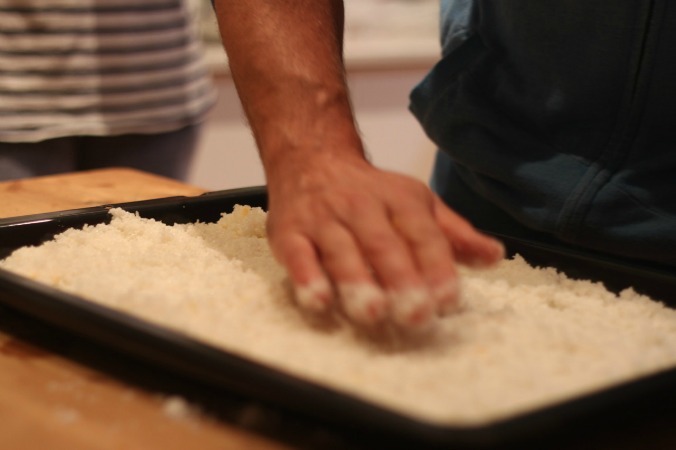 This was quite fun – a little like making a sand castle. 8. Whack into a hot oven (180 degrees) for 40 minutes. 9. 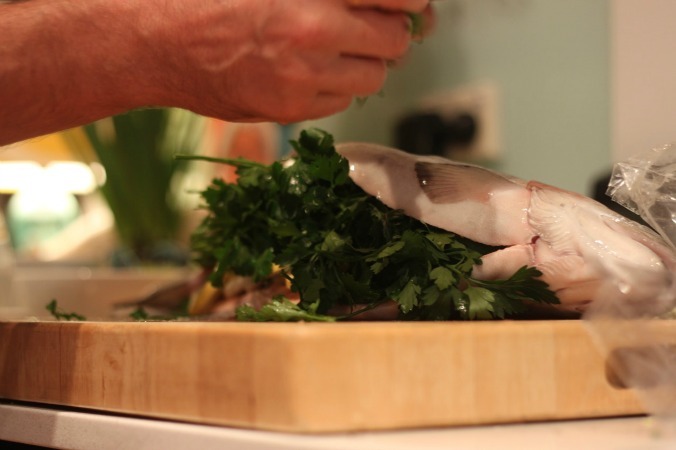 After 40 minutes pull the fish out and stab with a sharp knife. If when you pull it out it’s warm to touch (place the knife onto your lip) then you are ready to go. The fish then sits for a further 20 minutes to further cook. It will keep warm without anything else happening…promise! 10. Now comes the fun bit. The original recipe says: with the tip of a knife, carefully slice into the salt, cutting all the way along the salmon spine, being careful not to slice into the fish at this point. Gently lift the salt casing off the salmon, then spoon away and discard the remaining salt, brushing away any excess from the top of the salmon. But what Jamie did on TV and what we did was whack/drop the platter onto your bench which will crack the salt casing. You can check out a visual for that on my Instagram here. 11. 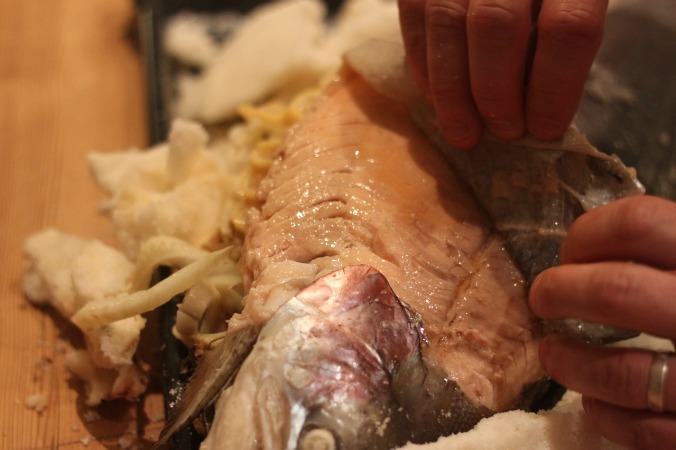 Peel back the skin and transfer the fish to a large platter. Divide up the salmon and serve with the basil mayo, chilli salsa and lemon wedges for squeezing over. The flesh itself is moist and delicious with the most amazing flavours, add in the extra sides and it is on a whole other LEVEL. It might seem like a bit of effort but as I said, when you are watching someone else make it with a Prosecco in hand and you are willing to do the clean up, then it’s dead set easy! 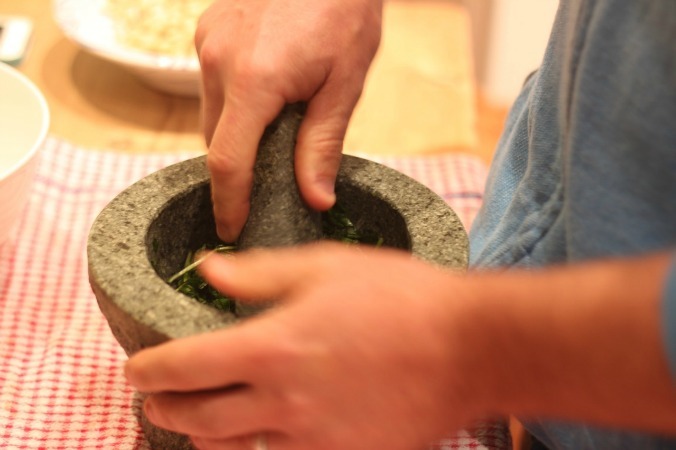 Take a bunch of basil and whack it into your mortar & pestle. give it a good bash with a lug of olive oil until you have a fine paste. 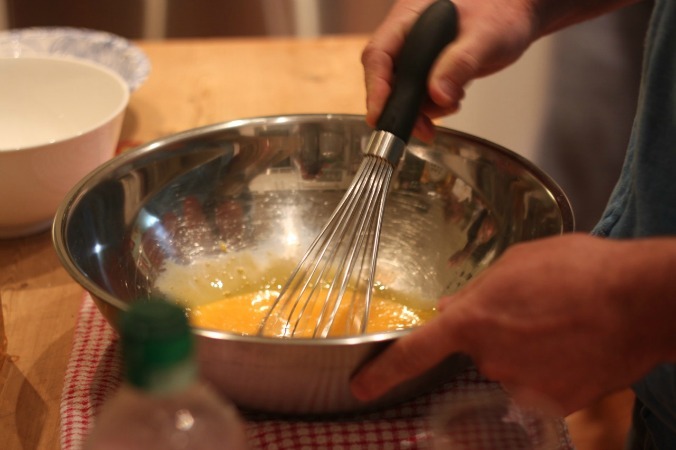 Place the egg yolk and mustard into a bowl, then gradually add the extra virgin olive oil, whisking as you go until silky smooth. 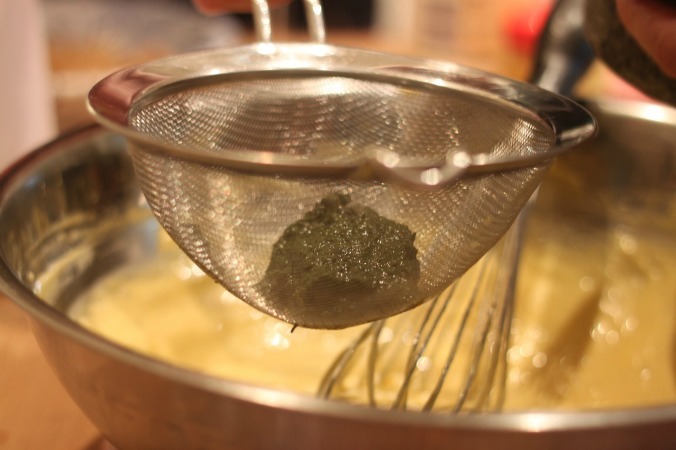 Take the basil paste and place it through a sieve into the mayo pushing the oil liquid through and leaving the basil leaves behind. 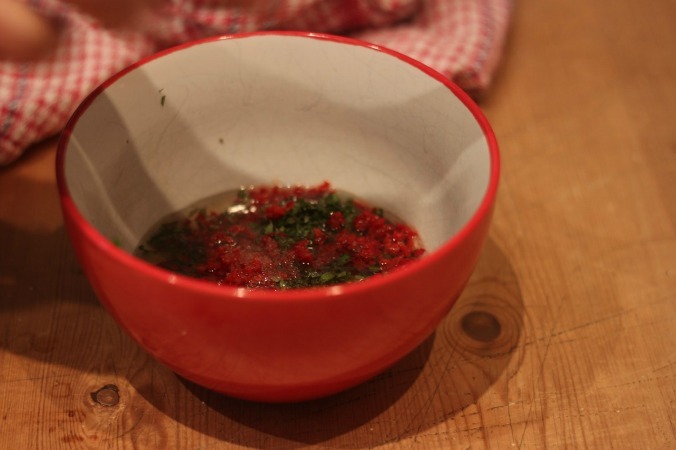 To make the salsa, finely chop the chilli and mint leaves, then place into a bowl with 1½ tablespoons of extra virgin olive oil and 1 teaspoon of vinegar. Season to taste with salt and pepper, then set aside. Now onto the stuffing of the fish: Wash the salmon well both inside and out, then pat dry with kitchen paper (leaving the scales on helps to keep in the moisture as it cooks). 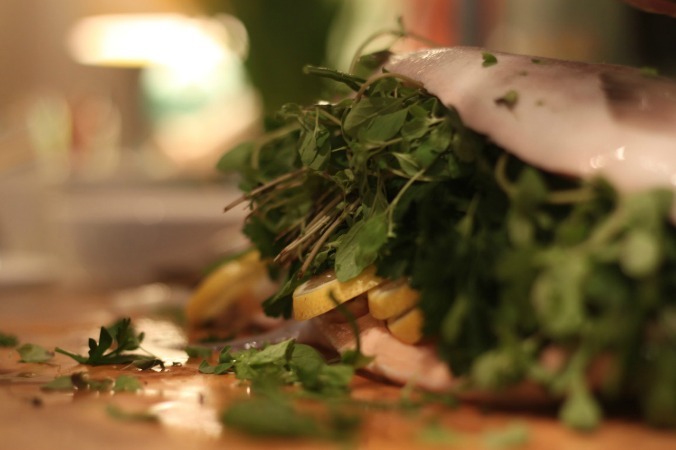 Finely slice 1 lemon and the fennel into rounds and stuff into the salmon cavity with the parsley, marjoram and chives. Shove as much stuff as you can into the fish, even when you think you can't add any more in, you can! Now for the salt crust: We didn't have the right salt for this...instead of rock salt we had normal salt, but it worked all the same. 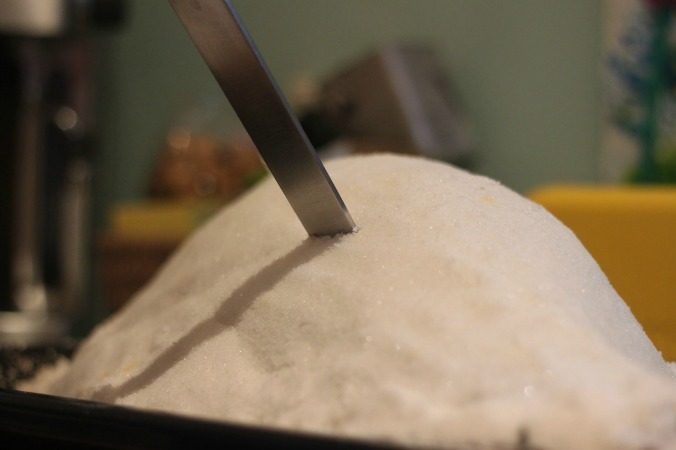 Combine the rock salt, eggs and 250ml of water in a large bowl, then evenly spread one-third of the salt over a large baking tray (roughly 35cm x 45cm), making a slight hollow in the middle to hold the salmon snugly. Lay the salmon diagonally into the tray, then spoon over the remaining salt mixture, heaping it around and onto the salmon so that it's evenly covered – you should have a layer of salt, roughly 2cm thick, all over the salmon. This was quite fun - a little like making a sand castle. 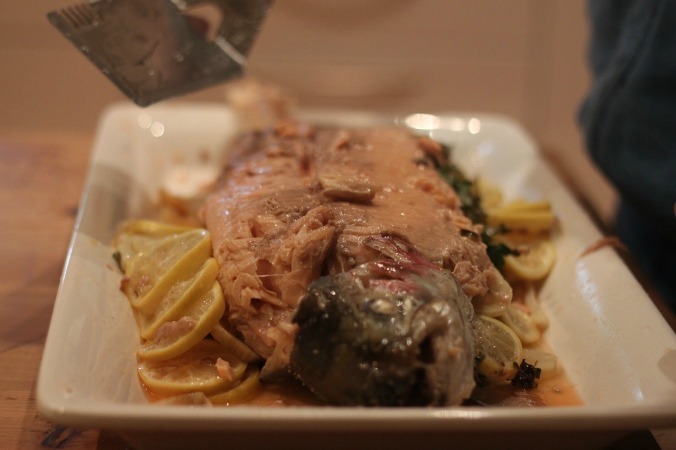 After 40 minutes pull the fish out and stab with a sharp knife. If when you pull it out it's warm to touch (place the knife onto your lip) then you are ready to go. The fish then sits for a further 20 minutes to further cook. It will keep warm without anything else happening...promise! Now comes the fun bit. 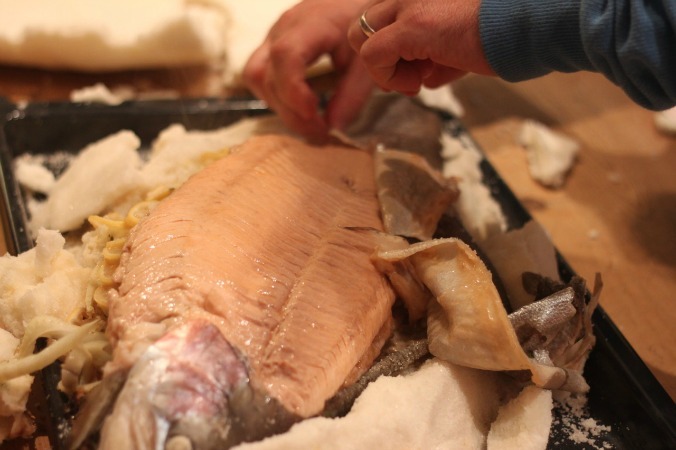 The original recipe says: with the tip of a knife, carefully slice into the salt, cutting all the way along the salmon spine, being careful not to slice into the fish at this point. Gently lift the salt casing off the salmon, then spoon away and discard the remaining salt, brushing away any excess from the top of the salmon. But what Jamie did on TV and what we did was whack/drop the platter onto your bench which will crack the salt casing. 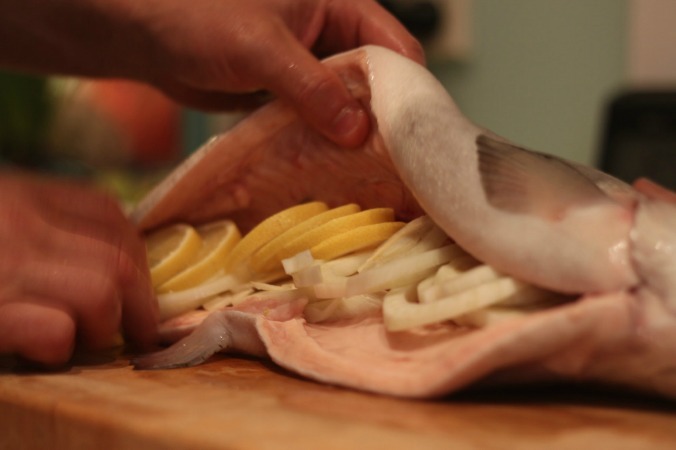 Peel back the skin and transfer the fish to a large platter. Divide up the salmon and serve with the basil mayo, chilli salsa and lemon wedges for squeezing over. The flesh itself is moist and delicious with the most amazing flavours, add in the extra sides and it is on a whole other LEVEL. 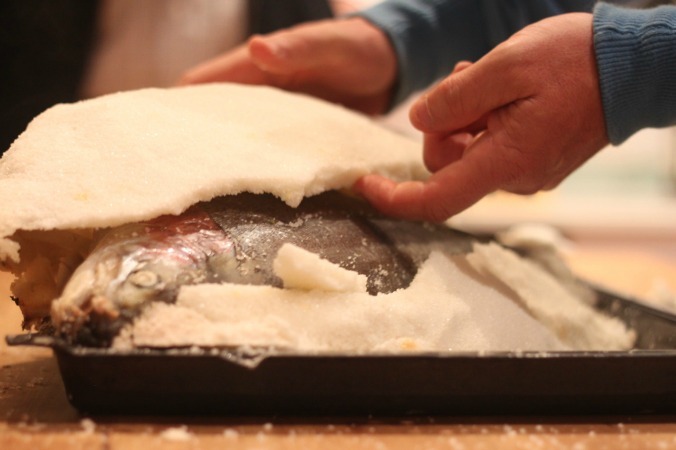 Have you ever cooked a fish in a salt crust? Outsource the cooking of seafood too? While it looks a bit scary I can assure you it was delicious. Well worth a shot! My mouth just totally filled with saliva. Damn you it’s a fast day on my 5:2!!!! This is DELICIOUS. Make it immediately. I saw this last week on Jamie’s show and thought that looks good ,I’m glad it was,we always have fish on Good Friday even though I’m not religious! I missed the show…might have to look it up apparently he was very dramatic with the cracking of the salt at the end!